Synchronous e-learning can deliver incredible results with learners enjoying the experience and you achieving your training goals. As with most training strategies, however, you must make sure you use best practices when deploying synchronous e-learning courses. 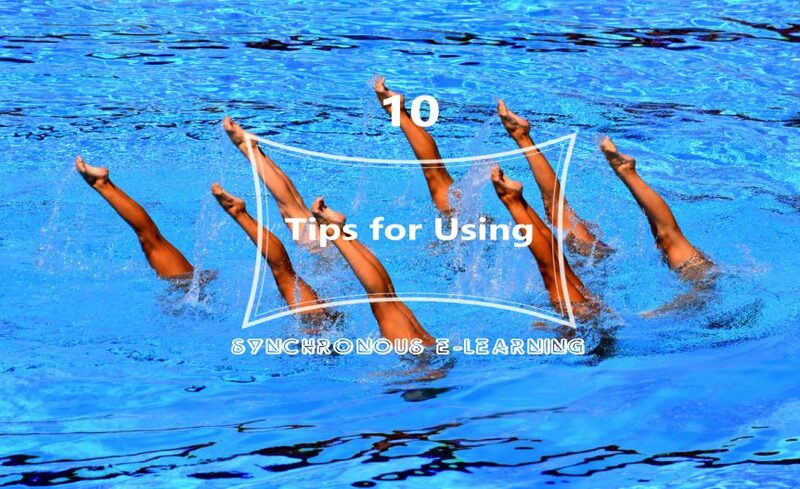 Below are 10 tips to help you get the best possible result when using synchronous e-learning. Before getting into that, though, here’s a quick synchronous e-learning re-cap. Synchronous e-learning is an e-learning course or module where learners “attend” a virtual classroom. This attendance is at a pre-set date and time and will include other learners as well as a trainer or trainers. As it’s virtual, the learners and trainers can be anywhere in the world. Instead of being in the same physical location, the learning takes place using live streaming, video conferencing technologies, instant messaging, screen sharing, whiteboards, and other communication and collaboration technologies. Synchronous e-learning is worth considering as it’s the most suitable option for many course topics. In addition, synchronous e-learning is more cost-effective than classroom-based training and engagement levels are better too. It also offers benefits over its alternative – asynchronous e-learning. Asynchronous e-learning is where the learner completes the course entirely on their own at dates and times of their choosing. In other words, there is no organised interaction or activity with trainers or other learners. While asynchronous e-learning is appropriate in many situations, synchronous e-learning offers advantages where you want the delivery of the content to be more personal. Training new employees is a good example. The important point here is not to do synchronous e-learning for the sake of it. Instead, you should have a clear reason and objective for using this strategy. For example, the course content might be too complex or diverse for a standard e-learning course that has no pre-arranged trainer interaction. The topic might also call for high levels of interaction through discussion and developing ideas in a group. Make sure you get reminders out to all the participants, stressing the importance of being ready and available at the pre-arranged start time. This is essential given the location and time differences you may be dealing with. Even though the trainer will not be in the same physical location as the learners, they are still responsible for setting the right tone and mood. Trainers should, therefore, be upbeat and enthusiastic about the course content. They should also be highly knowledgeable too, as one of the advantages of synchronous e-learning is it gives learners the chance to ask questions. Crucially, it’s also important the trainer is technically proficient. They will set the wrong tone completely if they are fumbling with the equipment and systems. It’s important the trainer outlines expectations. This should be done in advance of the course and there should be a reminder at the very beginning. Those expectations should include advice that the learner ensures there are no distractions. Remember, once in the live training session, the trainer will have little control over this. Therefore, it’s important that learners understand their responsibilities. Another important expectation to highlight is the required levels of participation. Remind learners they won’t get as much out of the course if they don’t engage with the trainer and with other learners. It is important trainers don’t just speak to learners for long periods of time. It’s always better to back up what the trainer is saying with a visual presentation. Following on from the last point, make sure the text on all visual presentations is easy and quick to read. This usually means using bullet points and short sentences. Trainers should encourage learners to ask questions throughout, so long as this doesn’t get the session bogged down on one issue or send the session off on a tangent. By asking questions, however, learners are engaging. With the five-minute rule, you do something in the live training session that involves learner engagement at least once every five minutes. So, break up your presentations with quizzes, asking open-ended questions, and using scenarios where learners must put what they’ve just learned into practice. In general, group activities should be used as much as possible. As mentioned above, scenarios are a great way of achieving this. Learners will have a better experience when they engage with other learners, they will feel more connected, and they will learn more. Finally, make sure the training is available to view or listen to (ideally view) once the session is finished. This is good for those who were not able to participate, but it also gives everyone who was involved something they can refer back to and check if they need clarification on any particular point. Your e-learning developer in Dubai will be able to advise you on the best approach for developing a synchronous e-learning strategy. This typically involves having elements of the course the learner completes on their own as well as a live session/s with trainers. Combining both elements achieves the best results and the best return on investment.